This helical bundle domain is the homodimer interface of the signal transducing histidine kinase family. 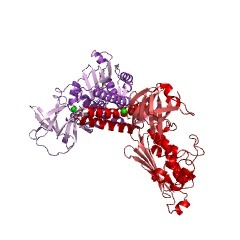 This helical bundle domain is the homodimer interface of signal transducing histidine kinases like CheA [(PUBMED:9989504)]. There are 18862 H-kinase_dim domains in 18862 proteins in SMART's nrdb database. Taxonomic distribution of proteins containing H-kinase_dim domain. This tree includes only several representative species. The complete taxonomic breakdown of all proteins with H-kinase_dim domain is also avaliable. Click on the protein counts, or double click on taxonomic names to display all proteins containing H-kinase_dim domain in the selected taxonomic class. Structure of CheA, a signal-transducing histidine kinase. Histidine kinases allow bacteria, plants, and fungi to sense and respond to their environment. The 2.6 A resolution crystal structure of Thermotoga maritima CheA (290-671) histidine kinase reveals a dimer where the functions of dimerization, ATP binding, and regulation are segregated into domains. 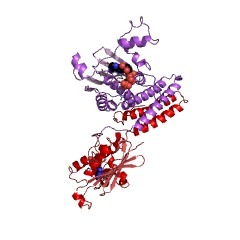 The kinase domain is unlike Ser/Thr/Tyr kinases but resembles two ATPases, Gyrase B and Hsp90. Structural analogies within this superfamily suggest that the P1 domain of CheA provides the nucleophilic histidine and activating glutamate for phosphotransfer. The regulatory domain, which binds the homologous receptor-coupling protein CheW, topologically resembles two SH3 domains and provides different protein recognition surfaces at each end. 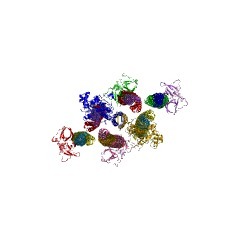 The dimerization domain forms a central four-helix bundle about which the kinase and regulatory domains pivot on conserved hinges to modulate transphosphorylation. Different subunit conformations suggest that relative domain motions link receptor response to kinase activity.